Carphone Warehouse has announced that it will be stocking the newly announced Google Nexus 7 tablet and also revealed a little tidbit about what Google is doing with Jelly Bean. 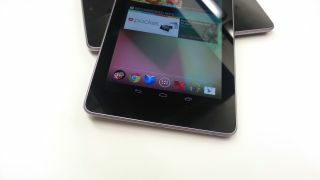 In a release, it explains that it will be stocking the 16GB version of the Nexus 7 for £199.99. Alongside this, the press release notes that the Nexus 7 "will be the first (and only for the next four months) tablet to run the new Jelly Bean operating system." Given that Google has been rather coy over who will get Android 4.1 (Jelly Bean) and when, this is the first piece of solid information we have been given as to how long Google is keeping the mobile OS to itself. The news will be a blow to all the other tablet OEMs out there using Android as an OS, as it means that the updated Google Play store will not be available to their devices until at least November 2012. This means it won't be available to the mainstream until BB10, Windows Phone 8 and iOS 6 are in the wild. It is also news that counteracts Google's own keynote where it said it would try and bring Jelly Bean to the Motorola Xoom some time in July - which does make sense as Moto is now under the Google banner. We have asked for clarification from Carphone Warehouse about its release.